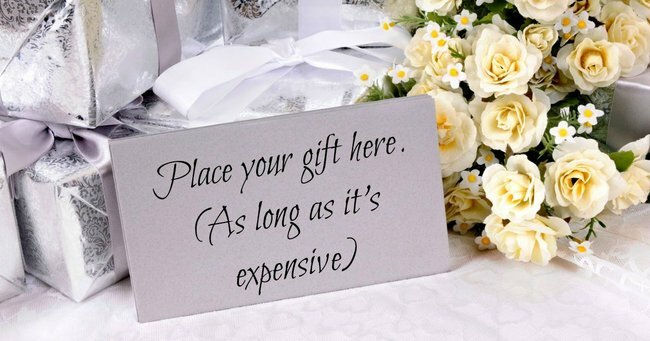 This is how much you should spend on wedding gifts, there is no grey area. Love is an expensive experience. Weddings even more so. Not just your own wedding, too. Because if you’re really a masochist, imagine adding up every penny you ever spent on a wedding gift. And now imagine all of the things you could’ve spent that money today. Fun game, isn’t it? Yeah. We didn’t think so. It’s a contentious one, navigating how much money is appropriate to spend on a couple at their wedding. Do you anonymously give them $20 in a wishing well and feel guilty for the rest of the night? Or do you give them enough money for them to buy 317 small puppies and resent them for years to come? Well, thanks to The Huffington Post Australia, they’ve done the hard work for you. They got the experts in, crunched the numbers, and if you’re a little frugal with your dollar bills you may not be too impressed. Is $150 an expensive gift to you? Alexis Teasdale, editor of Cosmopolitan Bride and founder of The Festive Co told The Huffington Post Australia that there isn&apos;t one rule of thumb when it comes to buying presents for a happy couple. You must consider whether you were in the bridal party, whether it was a destination wedding, how much the couple had outlaid and whether or not you actually like the couple at all. I&apos;m joking, she didn&apos;t say the last bit. But I&apos;m sure in the complex algorithm of valuing how much a married couple is worth to you, likeability trumps all else. "In my own experience, as a single, I would aim for the $150 mark and now that I&apos;m a couple, we double that," Teasdale said. But if the happy couple are making you travel to watch them tie the knot, then the game changes just a little and it&apos;s not wholly necessary to shell out what you would normally. "You&apos;re likely paying for accommodation and even flights, so in that kind of situation it&apos;s fair to assume the bride and groom are conscious of how much everyone is already spending," Teasdale said. Interestingly, Teasdale also admitted that although those in the bridal party will often be the guests closest to the couple, they&apos;re not also expected to spend exorbitant amounts of cash. It&apos;s likely they&apos;ve already outlaid a fair chunk of money already, and a wedding present is just a small cog in a overwhelming machine of wedding expenses. So there you have it, I guess. Don&apos;t be stingy, buy the gift and make sure at your own wedding you&apos;re not the idiot who asks for "no presents, please". That&apos;s your time to make your cash back.